Here are four top risks that cause playground injuries. Click for full size. 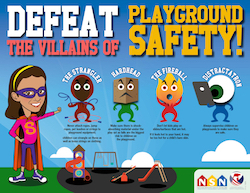 Keeping our kid’s safe while out on the playground is an issue we can all get behind, and one that benefits the community as a whole. So let’s all get out there and have some fun!